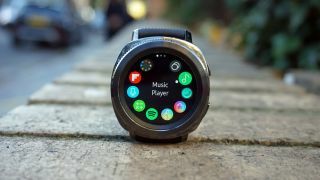 Over the past few days we've heard rumors of the Samsung Gear S4 smartwatch and Galaxy Tab S4 tablet launching alongside the Galaxy Note 9, but a new rumor suggests they'll actually land a little later than Samsung's next phablet. According to SamsungMobile.News on Twitter, both of the two new products will launch after the Galaxy Note 9 and will probably appear at IFA 2018. The Galaxy Note 9's launch is rumored for the start of August this year (it's likely to land at an event in New York hosted by Samsung), while IFA takes place between August 31 and September 5. That probably means we'll hear about Samsung's new smartwatch and tablet just before the start of IFA, as most manufacturers announce at the end of August before the show kicks off. That would be an exact year after the launch of the Samsung Gear Sport and around a year and a half after the Samsung Galaxy Tab S3 was announced alongside the Galaxy S8. These rumors are yet to be confirmed, but considering we're starting to see leaks of both products quite consistently it suggests the company is readying both for a launch sooner rather than later. Rumors for the Gear S4 suggest it will come in two different sizes, while the battery size is set to be increased as well. The Tab S4 meanwhile could have a Snapdragon 835 chipset, 4GB of RAM and a 10.5-inch 1600 x 2560 screen.